The two Ducati Team riders Andrea Dovizioso and Michele Pirro finished sixth and seventh respectively in the TIM San Marino GP, the thirteenth round of the MotoGP World Championship which was held today at the Misano World Circuit. 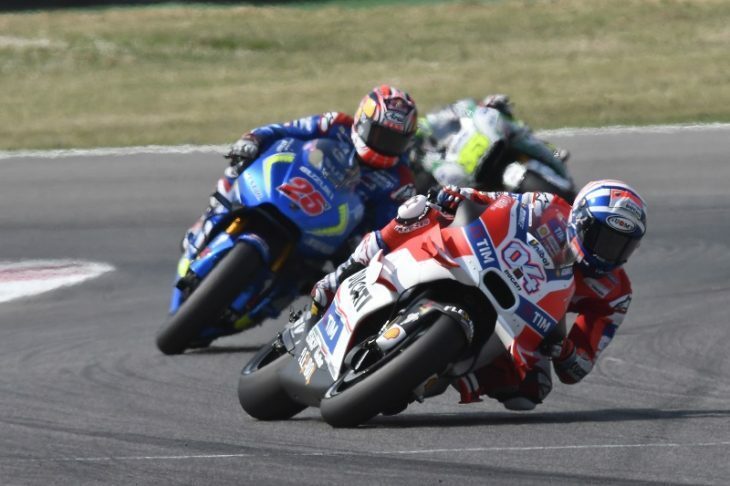 Dovizioso, who started from the second row after qualifying sixth quickest, scrapped for fourth place in the opening laps with Marquez, Pedrosa and Viñales. The Italian then crossed the line on lap 11 in sixth place and kept that position until the chequered flag. Pirro started the TIM San Marino GP as replacement rider for Andrea Iannone, who injured his back in a crash on Friday morning. The Italian, tester for the Ducati Test Team, started the race from row 2 with fifth quickest time set yesterday in Q2, but he was unable to get away well and crossed the line at the end of lap 1 in ninth place. Michele then moved up into seventh on lap 23, when he passed Crutchlow and finished the race in that position.